Central Park is New York City’s crown jewel. It is the lungs of the city. The park covers 843 acres. On this vigorously ambitious walking tour you will discover sights within this great urban oasis that you never could have imagined were there. 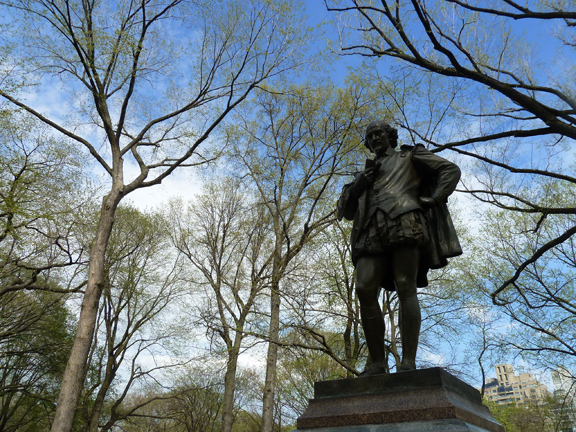 The Bard in Central Park. Bethesda Fountain with The Lake and The Ramble in the background. Some of the sights you will see include two tributes to William Shakespeare, one near the start and one toward the end; The Mall, a quarter-mile long promenade lined with American Elm trees, and the lovely Bethesda Terrace; the monument to General Sherman, a daily visitor to the Park in the 1880s. Strawberry Fields, the remembrance of John Lennon, and The Dakota apartment building where Lennon and Yoko Ono lived are included. You will see the charming Swedish Cottage. Belvedere Castle, the highest natural point in the Park, offers sweeping views; the monument to a Polish king and the oldest and most curious man-made object in the Park are nearby. The Lake, with its rowboats, and The Ramble are on the itinerary. Discover the connection between the Sheep Meadow and the Tavern on the Green, which is the finishing line for the New York City Marathon. The Tour comes to an end at the U.S.S. Maine Memorial Monument in busy Columbus Circle. The cost is $30/person, $20 for seniors 65 years and older, and $15 for youths 13 to 18 years of age. The tour lasts 2.5 to three hours. During the tour guests will navigate five sets of steps and many inclines. This is a quick-paced and very vigorous tour. It is strongly suggested that you travel light; we are on our feet for the entire time. Heavy backpacks and shopping bags can only distract from your enjoyment of the Tour. We gather in front of the Pulitzer Fountain, which is opposite to the Plaza Hotel, at West 59th Street and Fifth Avenue. Consult the Tour Calendar for dates and time of the Central Park Walking Tour. Tours must be booked at least 36 hours in advance. All sales are final. The Central Park Walking Tour will take place rain or shine. All tours are conducted in English only. All Tour participants assume normal liability for their behavior during the Tour. Don’t see this Tour scheduled when you want to book it? Contact us by e-mail; we will try to arrange a date good for you. Who is this sword-waving figure? Discover where this odd object is. Imagine mosaic in Strawberry Fields.